Skelton Crew Studio has teamed up with writer/artist Andrew MacLean to release an epic new vinyl figure based on his awesome Image comic book series, Head Lopper! The comic’s star is Norgal (aka the Head Lopper), a Viking warrior who sets out for action and adventure with the nagging severed head of Agatha Blue Witch. This super unique comic book character has now been meticulous transformed into an officially licensed 9” vinyl figure. Here’s hoping we see the release of an Agatha Blue Witch accessory to go with Norgal! 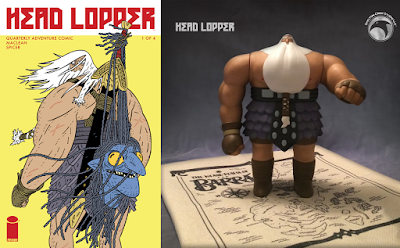 The limited edition Head Lopper Norgal vinyl figures four points of articulation (shoulders and wrists) and comes packaged in a full-graphic box. 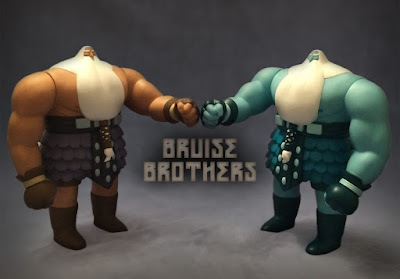 This fantastic new figure is currently available for pre-order at the Skelton Crew Studio online store in three colorways: Original Edition, Bog Blue Variant and Paint-Your-Own Blank White. The OG Colorway retails for $55, but any orders placed by July 1st will receive early bird pricing of $48 and include an exclusive canvas map of Barra. The Bog Blue Variant retails for $48 and will ONLY be available for the month of June. After July 2nd, the run will be set and this colorway is riding off into the Viking sunset. 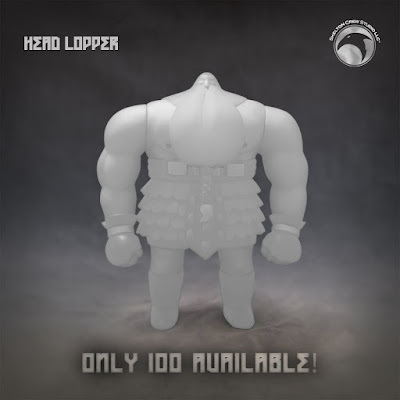 The DIY Unpainted version is limited to just 100 pieces, comes hand numbered, and retails for $48.